The World Economic Forum predicts the gender pay gap, which stands globally at 23%, won't close entirely until 2186. That's why the U.N. has made the theme of this year's International Women's Day "Women in the Changing World of Work: Planet 50-50 by 2030." In keeping with that theme, we wanted to understand what women of working age are watching on YouTube and which ads are resonating with them. We uncovered three key trends: a significant increase in watch time of business-focused content; a desire to continue learning outside of work through how-to videos; and a preference for empowering ads. Read on for the latest insights on what women are watching on YouTube. Source: YouTube Data, Global; classification as Entrepreneurial videos were based on public data such as headlines and tags, and may not account for every such video available on YouTube, Jan.–Dec. 2015 and Jan.–Dec. 2016. Additionally, female watch time for content related to small business, business news, and business services more than tripled year over year on YouTube.2 As the U.N.'s International Women's Day theme asserts, "The world of work is changing," and women are changing with it. They're using new media, such as online video, to learn and grow in their careers. Women are more likely to seek a "how-to" video than a beauty video. Follow the data, not the stereotypes. A woman might want to build a house, not build her beauty regimen. Moms might be seeking gaming tips, not parenting tips. Don't assume a millennial mom has the same priorities as a Gen X mom. This generation of women is asserting their right to preserve their personal passions online, and they certainly don't conform to stereotypes. Millennial moms prioritize their personhood, not just their parenthood. 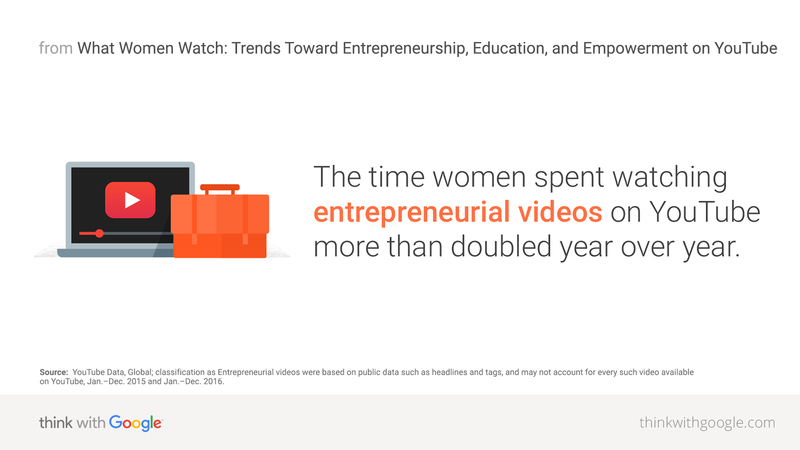 The sudden boom in business-related video viewing among women on YouTube suggests we're looking at a generation of self-starting entrepreneurs. They know how to use online video not just for play, but for work. When they aren't focused on improving their careers with online video, women are more likely to focus on how-to videos than beauty videos. Moms are actually watching slightly less parenting content than dads. By bringing data like the above into media plans and creative brainstorms, brand marketers can reach women based on what they are watching, not what we assume they're watching. Happy International Women's Day. Here's to giving working women a voice—and to brands that are taking up the cause. On that note, check out our International Women's Day YouTube Ads Leaderboard, which ranks the most-watched empowering ads among women globally. Women have spent more than 1M hours watching these ads, which cover everything from equal emojis to the challenges of being transgender. See the empowering ads women are watching most. 1 YouTube Data, Global; classification as Entrepreneurial videos were based on public data such as headlines and tags, and may not account for every such video available on YouTube, Jan.–Dec. 2015 and Jan.–Dec. 2016. 2 YouTube Data, Global; classification as Small Business, Business News, and Business Services videos were based on public data such as headlines and tags, and may not account for every such video available on YouTube, Jan.–Dec. 2016. 3,4 Google/Ipsos Connect, U.S., YouTube Cross Screen Survey, n=2,004 U.S. consumers aged 18–54 who watch videos at least monthly, Jul. 2016. 5,6 Google/Ipsos Connect, U.S., Human Stories: Gen X and Millennial Parents, n=3,206 U.S. respondents aged 18–54 who go online at least monthly, Sept. 2016. 7 YouTube Data, Global, "ads" defined as "paid views," Jan.–Dec. 2015 and 2016. 8 YouTube Data, U.S., 2014–2015. 9 Google Consumer Survey, U.S., n=1,500 women aged 18-34, Feb. 2016.